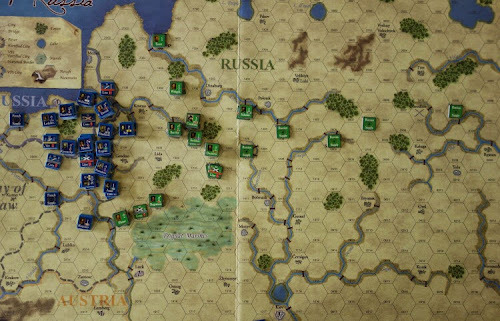 The Invasion of Russia is a new title from Europa Simulazioni, designed by Stephen Pole and developed by Nicola Contardi. It is the first game of a potential new series (dependent upon sales) on the campaigns of the Napoleonic wars at the strategic level. 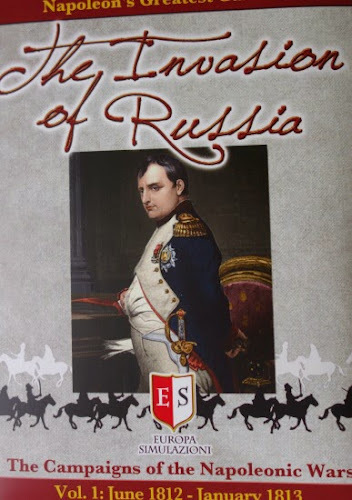 We are presented with the Russian campaign of 1812 running from June 1812 to January 1813 and a bonus scenario that looks at an alternative history in which the French decide not to press on towards Moscow in 1812, but rather wait and renew the campaign in the summer of 1813. This post will examine the system in some detail by way of an AAR covering the historical scenario, with particular emphasis given to the sequence of play during turn 1. To read the rest of this post, please click on the 'Read More' tab. The 1812 campaign is a fascinating subject. I have played quite a few Borodino games, but these invariably have the armies set up right in front of each other ready for a blunt head on assault, with little scope for imaginative use of tactics or other deployment options and the games reveal little of the true nature of the armies. By contrast, the months before the battle had seen substantial manoeuvre, with the Russian armies repeatedly managing to slip away from the French and maintaining a continued threat in the field. The campaign provided several opportunities for action other than those that actually occured that could have proven both interesting and decisive. Within the Russian hierarchy there were powerful voices who wanted the Russian forces to engage the French much earlier and so the rich potential of this campaign seems the ideal platform for this system on its first outing. It has to be said that this just feels like a lovely thing to own. A lot of care has gone into producing it and the designer is very active on the various forums to ensure that players get his full support. The game is set at the lower end of the complexity scale, describing itself as having a complexity factor of 2 (out of 5). The game brings some new system (to me at least) to the table and so on initial reading, it does not have the feel of a particulary low complexity game as there seems a lot to remember. I initially found the rule reading a bit heavy going, however the rules exactly follow the sequence of play, so the best way to learn the game is to actually play it and as you come to each sub section of the sequence of play, just read the three or so paragrapghs of rules that relate to that phase. This makes entry into the basic game relatively fast and painless. The play aid is good and the rules have key words in bold and are stubstantially cross-referenced with other associated rules, which also helps. There are advanced rules and these are quite straight forward. While many regular gamers might use advanced sections during their first game, I think for the reasons given above, gamers will generally want to halt at the end of the basic rules and get some counters on the map to get that system under their belt first. So basically, the game on initial inspection can feel more convoluted than it actually is, but after a few turns, play should be running quite smoothly. 1/ Supply matters - Players will need to build a chain of supply from their respective map edges by creating depots in cities. From this chain, new depots can be created deeper into enemy territory. This supply chain gives the protecting of 'Lines of Communication' their proper historic significance and will influence the conduct of the game. 2/ Supply matters (again!) - Formations need to be allocated supply trains if they are to perform important functions of rally and move and this can only be done if they are within supply range of a friendly depot and with a leader. But note, the supply chain only matters for creating new depots, the chain does not need to be intact for a unit to draw supply from it. The unit draws supply from a depot without regard as to whether the depot itself has a supply link to the map edge. 3/ Supply - At the start of the turn, a player gets an allowance of supply chits, which diminishes as winter approaches. The player must balance using those chits to create / maintain depots and allocations to formations to move and rally. This keeps the supply aspect of the game simple, fun and challenging without a ton of rules overhead. What is nicely modelled is that as supply lines extend and more depots are built, there is less supply left to allocate for rally and movement - long lines of communication are bad, short ones are good. 4/ Combat Commands - These are points allocated to each player at the start of the turn and they can be used to augment the chances of putting in an attack (seldom a certain thing) or having adjacent units support a defence etc. 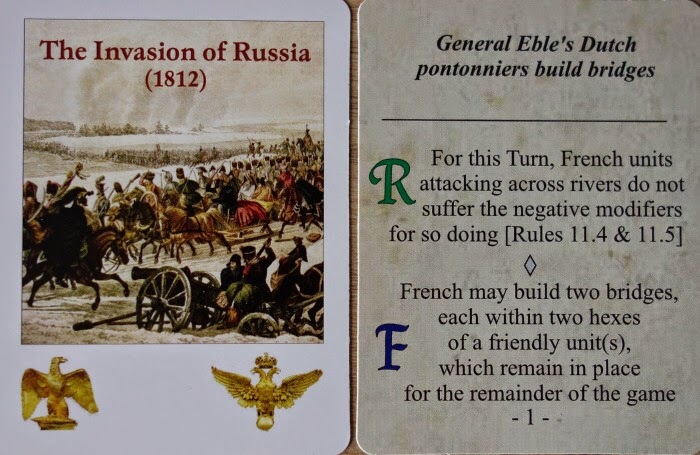 The French get 4 points per turn and the Russians get 3, though this can change during play when a decisive victory is gained in a battle. 5/ Disruption - Hits and other attrition result in units being disrupted and further disruptions remove units from play. Stacks containing even 1 disrupted unit cannot attack, so the player is forced to try and maintain (by spending supply on rallying) a viable ordered force in the field. As supply gets harder towards winter, the French attrition due to non-combat aspects of the game can be a shocking revelation to the player. 6/ Troop quality - All units are either Veteran, Line or Conscript. The essential difference is the stacking value of each. Up to 6 stacking points can occupy a hex. Veteran units have a stacking value of 1, so six veteran units can be in a stack, while Line have a value of 1.5, so only 4 of those units could be in a stack. Conscript value is 2. The greater the number of units in a stack, the more effective the attack or defence. Veterans have some other advantages as well. 7/ Battles - A single stack attacks a single enemy stack, both sides then get an opportunity to draw support from any friendly stacks that are adjacent to the target hex and that brings in all sorts of nuances regarding command capability, terrain etc - nothing is certain, you may not get your support after all! 8/ All of the above - collectively works together to make the conduct of the game feel just like the campaign accounts that I have read, while still allowing the wide permutations that could have spun out from this campaign (i.e. it is not overly scripted). I always enjoy a certain amount of chaos in gaming and those games that wrest some contol from the player often give better play experiences. 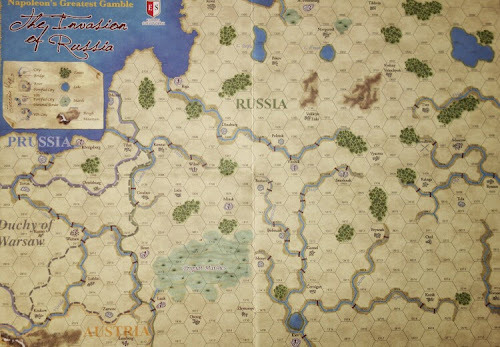 Here the player will feel the constraints of campaign and armies cannot just simply romp around the map. Set up - The map (above) covers an area from Danzig in the west, to just beyond Moscow in the east. This AAR will follow the historical set up, though a 'free set up' is also available in the rules. The below photograph shows the views from behind the Russian First Western Army (in the north). The below photograph shows the view from behind the Second Western Army (in the south). The counters are both nice and very functional. The formation uses the nato symbol, colour coded for nationality (example - Polish are magenta) and they typically represent a division. The play information on the counter simply recognises whether the unit is veteran, line or conscript and the number is essentially the stacking value (called the 'occupancy factor'). The rear of the counter shows its disrupted status. The number on the leader counter is their commander rating which is important in setting up battles. The sequence of play is slightly unusual. Throughout the turn, there is a sort of semi - simultaneous involvement of both sides going on. The sub phases are jointly played out by both players before moving onto the next phase, but within the sub-phase one of the players will generally perform one act first and then the other performs an act and then it will revert back to the first player for another act etc, until the sub-phase is complete. So the sub-phases have an alternating involvement of the two sides and by the end of a single pass of the entire sequence of play, both players will have conducted their turn. To see this in action, we will have a closer look at Turn One and then the AAR will just give way to an overview of play, noting only the important events as they crop up. Initial plans are - The Russians want the 2nd Western Army (by the Pripet Marshes in the below photo) to abandon Brest and shorten their supply line and prevent envelopment of that force. The French want to defeat the Russian army in the field, while also pushing towards St. Petersburg (top centre) for territorial victory. Opportunites to unhinge the Russians and put pressure on their line of communication will always be taken. Turn 1 - June 1812. (Advanced rule - card use) Each player draws a new card and compares it to the one that they currently hold in their hand. They then decide which one of the two cards to play. The below photo shows the cards that the players drew during the set-up of the game - to give them their 'existing' hand, the French card is on the left and the Russian on the right (note this mechanic is fine for solitaire play). The newly drawn French card punishes the French extended supply by disrupting 3 French units. They choose to play this simply to get it out of the way while it is easy to deal with. 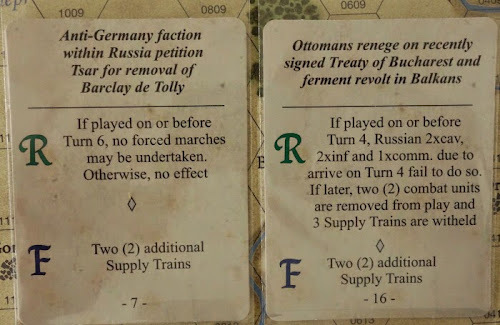 The Russian new card removes two supply trains from their allowance this turn. This would leave them only 1 supply train, but the original card in their hand (drawn during set up and shown above right) is worse, so they play the new card. General Supply and Attritional Phase - To be in supply a unit must be able to trace to a friendly city containing a depot. Supply lines are 5 hexes long in summer and just a cruel 3 hexes in winter. Any out of supply unit is flipped to its disrupted side. An already disrupted French unit that goes out of supply is removed from play, while a disrupted Russian unit in the same situation simply remains disrupted (the Russian scorched earth policy in this campaign had an absolute critical impact on the French supply situation). 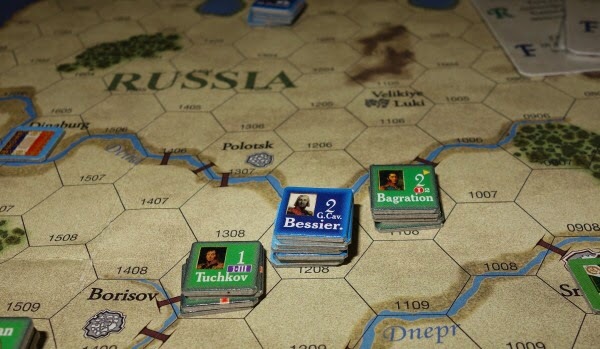 The supply line cannot cross a river, except at a bridge, cannot cross difficult terrain (edit - Russian supply lines can cross difficult terrain) or go via a hex that is adjacent to enemy cavalry (nice touch of giving cavalry this characteristic). This is a simultaneous phase and in our game everything is in supply at this point. A/ Convert one depot into a supply train - The French do not have anything suitable for conversion, but the Russian side have VIII Corps at Brest (under Platov) which they will want to abandon and they do not want to leave a depot behind for the French to destroy, so they convert their depot to a supply train, which they will later be able to burn off for movement to leave the area. 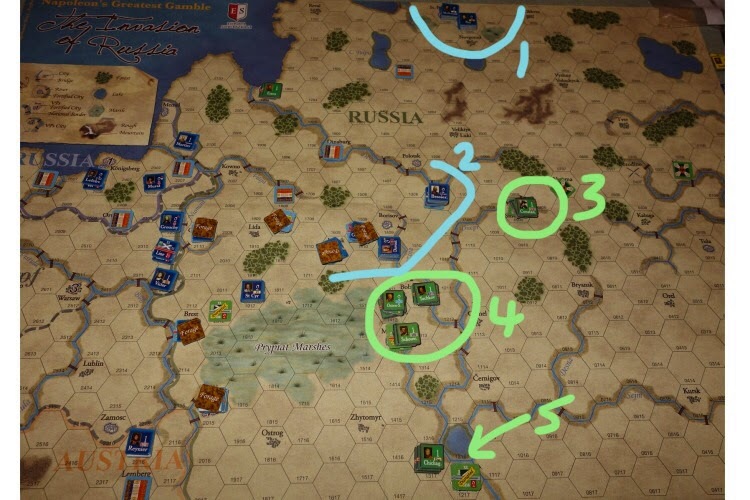 B/ Allocate supply trains - This is a joint phase, the player with the most supply trains goes first (the French have 14 to the Russian 11 at the start of play). They can only be allocated to an 'in supply' hex that contains a leader. The allocated trains can create a depot in a city or prepare a stack for rally or movement. 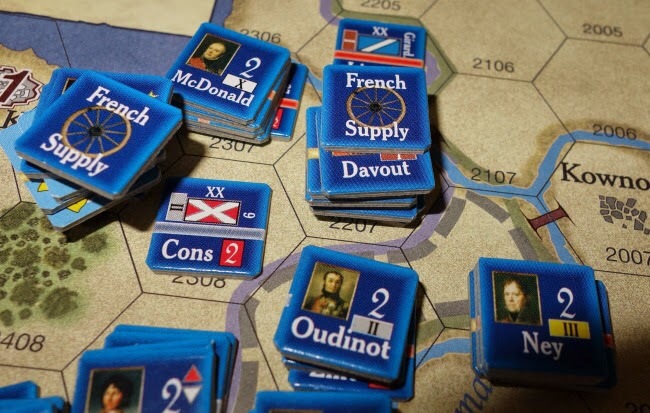 The French will certainly want to rally those 3 units that had to disrupt in the card playing phase (from the Guard! ), so they place the first supply train on them. Then the Russians get to place a supply train (their only one as it now turns out after the card play). They will want to move Bagration's stack (2 hexes east of Brest) as they plan to abandon the area, so they place their train counter with him. Play then shifts back to the French player to place the next Supply train. They know that they will not want to place any new depots or rally anything else, so they can now concentrate on giving supply to those stacks that will need to move. They place their next train counter on Davout at Tilsit. Play would now revert back to the Russian player, but they have run out of train markers, so play stays with the French, who place the rest of their markers. C/ Create new depots - Supply trains that have been put onto cities can be use to create new depots. neither side wish to do that this turn. Advanced rule - at this point on turns 1 and 2, the French reserve cavalry must test for losses. Because Napoleon had invaded early, the oat crop had not yet been harvested for that year and his horses suffered terribly as a result. The player rolls a D6 and loses that many units. They roll a '6' and this starts to feel serious. They use conscripts to fulfill the first 4 losses and two line units to make up the 6 losses. A/ Rally disrupted units. A stack containing disrupted unit(s) that is in supply, with a commander and having a train marker can automatically rally all disrupted units, up to the combat rating of the commander. The Guard are with Napoleon who is rated as 4, so they can easily rally the three disrupted Guard units in his stack. The stack loses a supply train marker to do this. This is a joint phase, though the Russian units do not have any disrupted units to deal with. B/ Move units strategically - Although called strategic movement, this is in fact just an ordinary movement phase. The side with the higher number of supply trains (French) move first. Movement is 3 hexes in summer, 2 in winter and 5 if using a Force March. The stack must be in supply, with a leader and have a supply train to spend to do this act. Poniatowski (V Corps) acts first, moving next to Playtov' Corps at Brest. On turns 1 - 5 (before Kutuzov arrives) there is some command chaos in the Russian armies and immediately prior to movement they roll a dice. On a result of 1 or 2 they fail to move. Platov spends the supply train to move, makes the test as stated above and fails ...... in a single moment the plans of 2nd Western Army to retire are compromised. The question is - does Bagration use his supply train to advance next to the now static Platov and support him in the battle that will likely follow, or does he withdraw his own formation to ensure their survival? But first, play reverts to the French player to spend one of their supply trains. 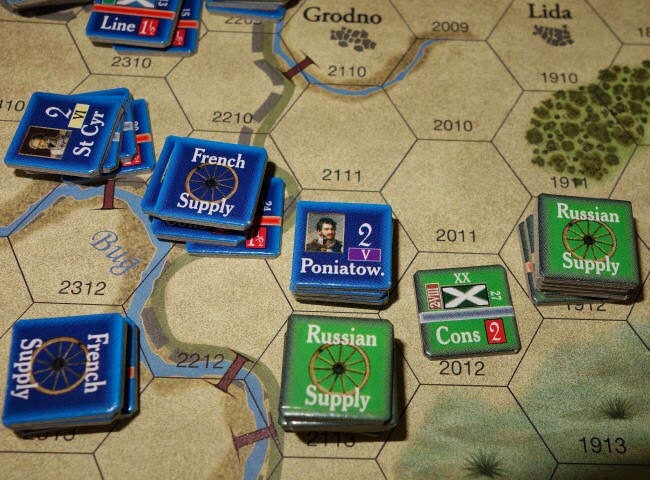 For the Russians, it feels a tight call, but Bagration decides to support Platov and expends his command train to move next to him (after passing his movement test roll), via the marsh (impassable by the way to the French - something I stupidly forget later on). Play reverts back to the French again, who bring up Junot's VIII Corps to contact Platov. Play now stays with the French because the Russians do not have any more supply trains that they can spend. In the north Davout's I Corps moves towards Wittgenstein. This is a 3 hex march, so the French must check for attrition for that 3rd hex. A D6 is rolled and they pass. Modifiers make these marches more risky if force marching or marching in winter. Eugene has to take a similar test and likewise passes without incident. Combat Commands Phase - we will examine one attack in full detail. 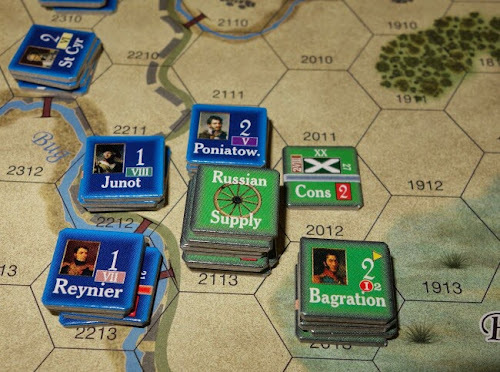 Poniatowski V Corps wants to attack Platov's stack at Brest. This is a joint phase. The side with the greater number of Combat Commands (CC) points on the track makes the first attack (French have 4, Russians have 3). So Poniatowski announces an attack on Platov. They have no disrupted units and are with a leader, so they can attack. Having been given the attack order, we must first check that the attack goes ahead. C/ Add the score of a D6, they roll 3 (gives +3). Note a roll of 1 results in an automatic aborted attack. Total A, B and C (gives 7 in this instance). On a final score of 7 or more the attack goes in - so they just made it. Next the attacker sees whether any of the other French units that are adjacent to the enemy stack will support the attack (in this case, both Junot and Reyniers are viable to give support). These two stacks must each test in the same way that Poniatowski did. They use the same two CC's but each get a new D6 roll. Junot checks first. Two CC's have been used (gives +2), the commander rating is 1 (gives +1) and the new die roll is 3 (gives +3) to give a total of 6. So Junot fails to score 7 or more and therefore he will not join in the attack. Now Reynier checks. Two CC's are used (gives +2), the commander rating is 1 (gives +1) and the new die roll is 1 (gives +1) to give a total of 4. So Reynier fails to score 7 or more and therefore will not join the attack. (edit - note, I have had to change the text here because I had that roll of 1 as 'aborting' Reyniers attack. The designer has pointed out to me that only the initital attacker ever suffers an 'abort' result, supporting stacks do not, though they can 'fail' to support by not reaching 7 or more, but this failure does not cause the end of that sides attacks - that only happens if the prime attacker fails). This attack is starting to go to rats! We now need to see which units Russian units will be involved in the battle. Platov is automatically in the battle, since he is the one being attacked. He wishes to call on support from Bagration, who tests as above, as does the single conscript infanty unit that is also next to Platov. This is an important moment, so the Russians choose to use 2 of their 3 CC's. Bagration tests first. There are 2 CC's used (gives +2), his command rating is 2 (gives +2) and the die roll is 5 (gives +5) for a total of 9. This is more than the 7 needed to fight, so Bagration does get involved. The single conscript infantry now tests. There are 2 CC's (gives +2), there is no commander (gives zero) and the new die roll is 3 (gives +3), this is a total of 5 and is not enough to get them involved in the battle. Now that we know who is fighting, we need to calculate the fighting values and the outcome. The value of the French attacks is calculated as follows. The Poniatowski stack get +1 for every unit involved (gives +4), for having combined arms of infantry and cavalry (gives +2), for attacks into a fortified city without having artillery (gives -2), for the leader rating (gives +2). There are no other stacks supporting Poniatowski, he attacks alone, so there are no further additions and his total attacking value works out as 6. To this is added a single D6 roll (in this instance it gives us a +4), so the final attack value for the French is 10. We get the value of the defenders as follows. Platov's stack (note in the advanced rules, Platov enhances his cavalry strengths but only when they attack) gets +1 for each unit defending (gives +4), combined arms of cavalry and infantry (gives +2), the leader rating (gives +2), which gives this stack a total attack value of 8. Next we calculate the strength of the supporting stack of Bagration. There is +1 for each undisrupted unit in the stack (gives +3) and for the leader rating (gives +1, this is always the generic value of a leader in support regardless of their real leader rating) for a grand total of 4 points for the supporting stack. The value of Pavlov's stack (8) is added to the value of Bagrations stack (4) to give a total defence value of 12. To this final value is added the score of a D6, which in our case has a '6' rolled - so the Russian defence is finally worked out to be 18. The defenders have clearly won by having the (much) greater score. This has two effects. Firstly, winning defenders can choose to withdraw - only here Platov is blocked by stacking restrictions. Secondly the difference between the two scores is translated into hits against the loser. The Russian 18 against the French 10 translates into 8 hits against the French. However, you cannot create more hits than the number of units that you fight with. The Russians had a total of 7 units fighting, so the 8 hits are reduced to 7 hits against the French. In reply half the number of the hits caused by the victor (rounded down) plus a potential modifier of +/-1 or zero based on a die roll are applied against the victor, so the Russians suffer 3 hits. They disrupt 3 of their units, but for the French to absorb 7 hits they must eliminate 3 units (i.e. 2 hits per unit) and disrupt their last unit. V Corps have been devastated, they are left with just one disrupted division. Junot and Reynier have much to answer for. Because 3 or more units have been eliminated, this counts as a decisive victory and this causes the Combat Commands track to be adjusted (permanently) with +1 to the victor and -1 to the loser. This moves the French position from 4 points down to 3 and the Russian from 3 points up to 4. What an awful opening turn for the French player this is becoming. Now that the French have made one attack, it is the Russian turn to do the same. They have no wish to attack, but by giving up this right, they lose the chance to attack again this turn. The phase reverts back to the French player who decides to attack Wittgenstein with Davout. They note that Davout has a good command rating (3) so decide not to spend CC's on his attack, rather, they will save those final two points for Ney's attack in the centre. Davout tests to see whether his attack is made. Command rating 3 (gives +3), no CC's (gives zero) and a single die roll (gives +3). The total is 6, so he does not make the 7 needed and the attack fails. This is a real lost opportunity for the French. Play does not revert to the Russians because they gave up the chance of further attacks by passing. However, play does not stay with the French either because a 'failed' attack means that no further attacks can be made by the player in that turn. This means that now Ney (below) with the assistance of Eugene will not be able to attack as intended and the two CC's being saved for him are wasted. Note - an 'aborted attack' when the player rolls a 1 is different than a 'failed attack' when the player cannot reach 7. The difference is that a failed attack stops further attacks being made, whilst an aborted attack doesn't. Commander Movement phase - This is a joint phase (edit - the player with the highest number of CC's goes first). 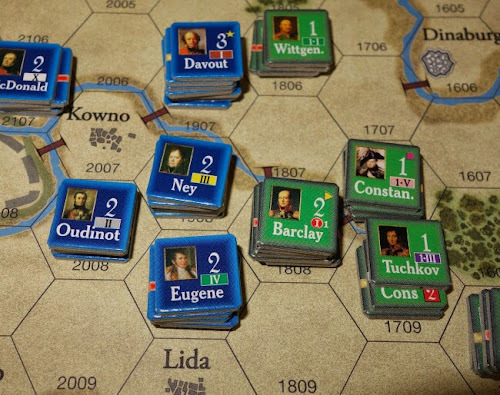 The players can move their commanders up to 3 hexes even if they have already moved. Neither side wishes to do this at the moment. Cossack Activity Phase - Each lone French unit on Russian soil and not in a city rolls for loss due to cossacks (loss on 5 or 6). The lone surviving disrupted division of V Corps needs to test, but they survive. Reinforcements Phase - there are no reinforcements on turn 1. That ends the sequence of play for turn 1 with both sides having jointly run through the sequence and 'sharing' the turn. Turn 2 - June 1812. Combat Commands Russian 4 and French 1 (reduced by 2 for this turn due to card play). Russian victory has given them some respite so that their southern forces can pull back. Bagration and Platov manage to abandon Brest (remember, until Kutuzov arrives, Russian stacks that want to move must test). The French Cavalry Reserve lose a further 3 units due to the problem with horse feed. This advanced rule in this paricular game has made quite a big difference to the Order of Battle (though note, the Cavalry Reserve do not even appear in the basic game). 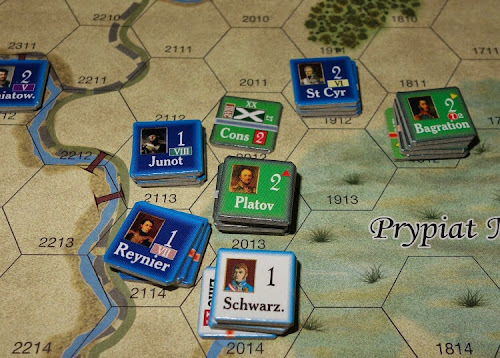 Junot captures Brest and fails an attempt to attack Platov. Davout wants to attack Wittgenstein but the presence of Constantine and Doctorov make that too risky, especially having regard for the French CC level. 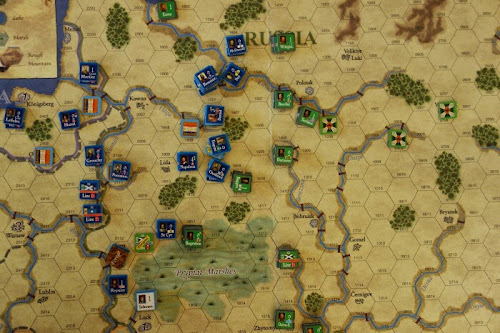 The French note Minsk as a vulnerable target for the next turn. 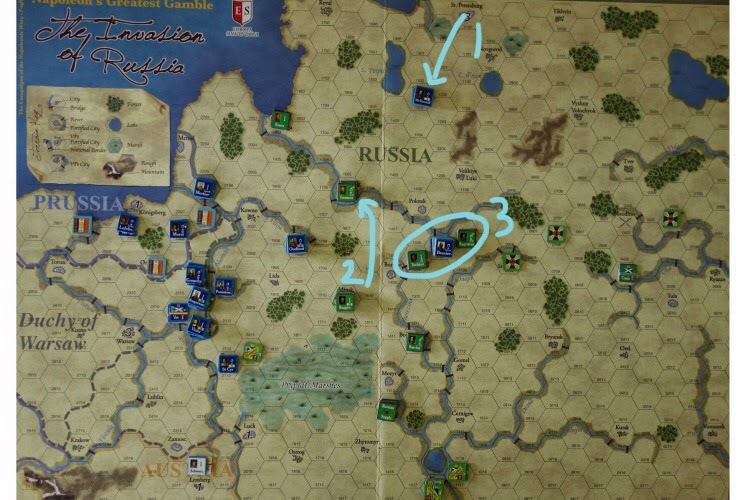 The first Russian reinforcements (3 divisions) come on at Kiev. Turn 3 - July 1812. Combat Commands Russian 4 and French 3. This turn, French units that are not allocated a supply train must start testing for forage effects. Despite the allocation of precious Russian supply trains, Platov and Bagration both fail to move (because of the Kutuzov advanced rule). They are becoming vulnerable to isolation. Davout launches a strong attack in the centre at Wilno against Barclay. Ney, Eugene and Oudinot all lend their support. This is a massive attack and the Russians decide not to try and get support into the battle as the supporting forces would likely simply absorb excess casualties and in turn become vulnerable themselves. It is a decisive French victory, which means the Combat Commands track will be adjusted in the next turn. Davout advances into Wilno with a view to it becoming the forward depot of the army in the next turn. Platov attacks Junot (below). 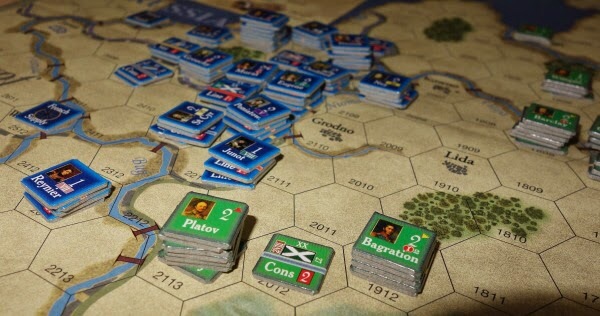 The Platov advanced rules allow him to strengthen his cavalry in attack. It is a Russian victory (2 hits) and hopefully the disruptions inflicted will deter the French from attacking down there this turn. The French (Austrians) plan an attack, but it fails to come to anything (edit - note I have the Austrians as a pure Austrian stack, but the advanced rules say that the reluctant Austrians can only attack if they have a French unit stacked with them). Turn 4 - July 1812. Combat Commands Russian 3 and French 4. Baggavout force marches to the aid of Minsk and helps to hold that depot. The Austrians and Junot attack Platov, who finally collapses. The entire stack, including Platov himself is lost. Turn 5 - August 1812. Combat Commands Russian 2 and French 5. Baggavout is defiant at Minsk - keeping that depot safe is helping the remnants of Bagration's force. McDonald and Ney cross the Dvina at Dinaburg, but Wittgenstein continues to evade and blocks the path to St. Petersburg. Turn 6 - August 1812. Combat Commands Russian 2 and French 5. With supply diverted to centre and north, Junot's and Rayneir's Corps have been ravaged by being unable to forage. Their formations have virtually ceased to exist. Failure to deal with Barclay in the centre now haunts the French as his cavalry interefers with French supply lines. Supply does not reach either Ney or McDonald and their formations disrupt. This prevents them bursting out Northwards to St. Petersburg and worse, prevents them setting up a depot this turn at Dinaburg. A concerted effort is made to deal with Barclay's troops. They are cleared, but another turn is wasted - though another French decisive victory results - these are adding up. Turn 7 - September 1812. combat Commands Russian 1 and French 6. The below photo shows the overall situation at the start of the turn. Top centre, MacDonald and Ney are starting their breakout towards St. Petersburg. Wittgenstein is the green stack sitting over the word 'Russia' on the map. At last Ney catches up with Wittgenstein, attacks him and forces a retreat. Ney does a follow up attack and removes the units and Wittgenstein from play. Eugene takes Minsk (centre of map). Turn 8 - September 1812. Combat Commands Russian 1 and French 8. McDonald and Ney are advancing towards St. Petersburg at last. In the Centre the French take Borisov, destroying a Russian depot (they go out of the game permanently). The number of supply trains available to the French by the scenario has started to decline - a reminder that winter will soon arrive. MISTAKE - I have been allowing the French to enter marsh hexes. Turn 9 - October 1812. Combat Commands Russian 1 and French 8. The Guard cature Vitebsk, removing another Russian depot from the game. During that battle, Docturov became a casualty. Turn 10 - October 1812. Combat Commands Russian 1 and French 9. Last turn before winter and things really get interesting. In the photograph below; (1) Macdonald and Ney capture St. Petersburg, destroy the enemy depot and Kutuzov and von Steinheil are both mortally wounded at the battle. (2) The Guard holds Vitebsk and the way to Moscow lays open. 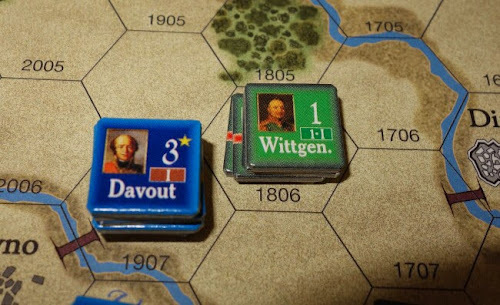 Davout is further south, he lacks a cavalry presence that would prevent enemy movement around him. (3) Bagration and Constantine force marched to Smolensk to block the Guards from any Moscow gambit. (4) the Remnants of the Russian armies are forming a hub around the newly created depot at Bobruisk. (5) Kiev is providing the gateway for fresh Russian formations to arrive. The brown counters show all the French formations that are having to forage for their supplies, this put them at risk of losses in the supply phase. The Russians can only hope that the hard winter does all the soldiering for them. They have taken huge losses, so while the French will be substantially curtailed by the winter, it looks doubtful that the Russians will be strong enough to deliver a decisive counter-blow. But we are only half way through the game, so who knows? Mistake - I have been claiming a decisive victory when simply 3 or more enemy are removed from play - but the 3 should be based on 3 EXTRA losses than the other side - so I will adjust the Combat Commands to account for some of that. Winter prevents MacDonald building a depot at St. Petersburg because he will be out of supply in the next turn, so he abandons the city and force marches to the depot at Pskov. Unfortunately, Ney must be left to forage. Just trying to keep Davout and Oudinot in the field in a good order state is absorbing all available supply. Ney again is left to forage. All other surviving French formations have managed to get themselves into cities that contain depots. This is a bad turn for the French, as if things are not hard enough, their draw card requires they lose 2 Supply trains this turn. This really closes them down. VI Corps (St. Cyr) is lost for the lack of forage. Davout and Oudinot are still in the field, resorting to foraging. Oudinot wants to fall back on Minsk, but without a supply train allocation it cannot move. This allows Baggavout to slip into Minsk from the south. Again no battles in this turn. 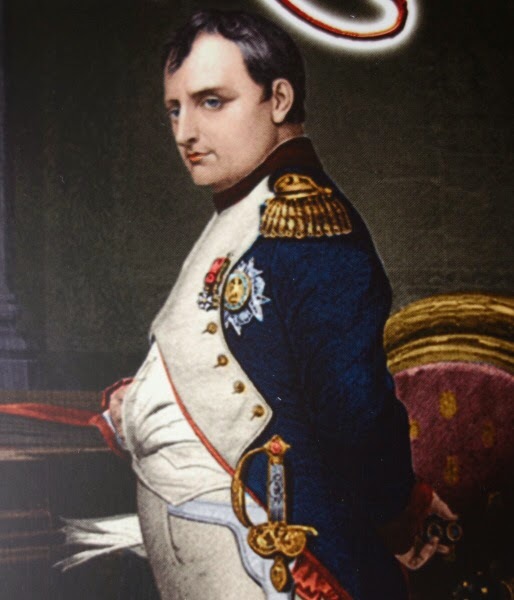 Card play - Napoleon returns to France to deal with a Coup d'etat and the French again lose 2 supply trains. 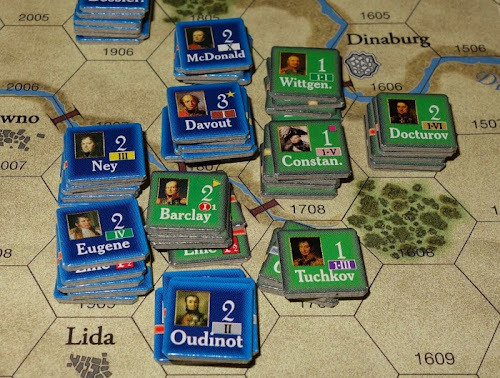 The French supply situation remains severe and Davout looks doomed due to the foraging demands of his large force. The Russians attempt to assault Oudinot outside Minsk, but the attack fails to go ahead. French supply drops to 9 and they already have much of their supply capacity committed to their depots. They are left with 1 supply train. Davout's I Corps is lost (due to lack of forage). 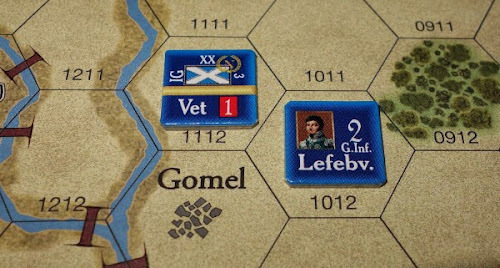 Tormasov and Baggavout attack and remove the remnants of Oudinot's Corps from play. Tormason force marches to Dinaburg, takes it and destroys the French depot there. Baggration and Tuchkov strike out against the French Guard at Smolensk. The Guard have already lost 1 division and 2 others are disrupted, leaving just 3 that will fight. Unfortunately for the Russian attack, Tuchkov fails to join in and the Guard manage to gain a small victory (1 hit) - the Guard stand defiant at Smolensk. That ends the game, a full 16 turns have been played. Some of the lessons that I learned from this first game are that the French must play aggresively early and once the high point of their advance is reached, dissolve some of the depots earlier in the supply chain, so that those counters can be available to boost the number of supply trains available during the harsh winter. For the Russians, pulling back a little faster would help the early Russian supply situation and put pressure on French supply. It might also allow more of the Russian force to survive, so that it is more capable of exploiting the French problems in winter. The end of game photo of the map (1) St. Petersburg is abandoned by MacDonald as he does not get enough time to build a depot there before the winter prevents it. (2) Tormason force marches to capture the French depot at Dinaburg. (3) The French Guard hold out at Vitebsk. The victory points come from two sources, the points caused for territorial gains (VP cities) and the effect of decisive battles. I though despite their bad start, the French did okay mid game and that the Russians were not really strong enough to prosecute a good winter game. The VP points give the victory to the Russians with 20 VP's v 8 VP's - though 9 of those Russian VP's come from the Decisive Victories track and I can't rely on the way I scored that - but in any case, a Russian win does seem okay, they were just getting back on their feet in the last couple of turns. My mistake in allowing all eliminations of 3 units to generate a decisive victory adjustment to the Combat Commands track meants that over time, the French CC levels grew, ensuring that more of their attacks and support got into action, which in turn perpetuated more victories - so had that mistake not been made, I am not sure how well the French would have actually done mid game. Conclusions - One is immediately struck by how nice the game looks and it is nice to have something that feels fresh to play and explore. I do not do much strategic level gaming and generally find things to do with supply quite dry. However in this instance, the designer has created a system around strategic supply that is fun and action packed. The nature of the subject means that play remains fluid and dynamic throughout with good replayability. For example, in our first turn the disaster that befell Poniatowski could have taken a very different turn. 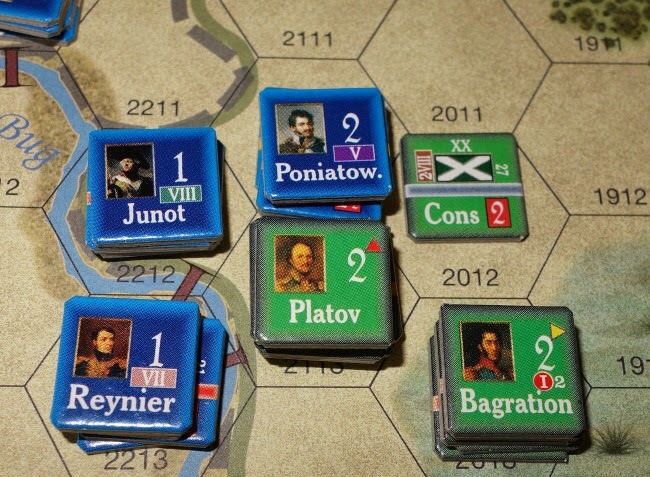 Imagine if Bagratition had failed his movement roll (Russian restriction for turns 1 - 5) and not joined Platov and that both Junot and Reynier had been able to support the attack and that Platov rolled a '1' instead of a '6' - or that Davout's attack against Wittgenstein had not failed to materialise - noting that by turn 2, he had lost his positional advantage over Wittgenstein. I found myself feeling the pain and exasperation of the real life commanders as one after another, French stacks were removed form the board for not being able to get supplies. This was the reality of the campaign and the resulting utter devastation of the French army who were unable to forage in the scorched land and it strikes me as a positive thing when a design generates an emotional connection through loosening player control - because it has suceeded in putting you 'there'. If this AAR is anything to go by, it seems to be a forgiving game in which a player can still feel they are 'in the game' even if they have some early set backs. The pace of the game and what can be done and perhaps more importantly what just lays beyond reach feels right. I really like the presentation of the game and the thouroughness and support of the designer / developer, who make a good team. The game would also be a useful campaign aid for anyone wanting to run the actual battles generated by using miniatures or even the Commands and Colors system from GMT. Complexity - The game description rates it 2 out of 5. This is probably accurate rating for anyone who is up and running with the system and has played a game or two, but when first coming to the game it can seem like there is a lot to remember. Described as low complexity game, the learning curve may surprise some, but the truth is that once the system is understood, it is not complicated in itself. Learning is best done by actually going through the sequence of play with a few stacks of counters on the map and reading the relative rules during each sub-phase, do that a few times and things start to become pretty much second nature. The rulebook was in my hands quite a lot for this first game but there is a reward that play is engaging and players playing right through will feel fully immersed in this campaign and of the nature of campaigning in general - overall this game gives a good playing experience, with a good balance struck between being stimulating and fun. There are plans to use this system in other campaigns. Presently the rulebook is quite Russian campaign specific. The designer may need to consider splitting the book into series and exclusive rules if several volumes are to follow. Size - With the half sized map and a play aid set to one side, this is a compact game that can easily go onto a kitchen table or desk. It will fit into a 2' x 3' space. Storage wise, think of it as a 1cm thick ziplock (it is a double folder folio game with a 1cm wide spine), plus some additional space is needed for the cut counters and sleeved cards. The rulebook has around 10 pages of rules and 3 pages of advanced rules. Solitaire - Typical of many two player games, this can be played solitaire without a problem. 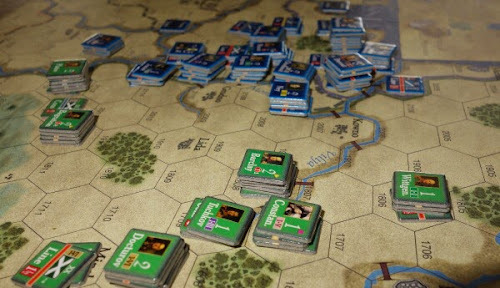 The two most significant aspects are the 2 (or 5 in the advanced game) dummy supply counters, which in a face to face game can add a bit of fog of war but in a solo game can be discarded without further concern. And the use of cards. I am not a big fan of card driven games (which are generally not solo friendly), but I do like card assisted games, which is how the cards are used in this game and keeping it solo friendly. They bring an extra dimension to the game without extra rules overhead and from the solitaire perspective, bring some uncertainty and chaos, which I think is always a helpful ingredient in any game and in particular when playing solo. Playing Time - The game description says 2 - 3 hours. So far, I am feeling that is an under-estimate, certainly for occasional play. I am guessing it will fill an evening (I wrote this article while playing, so I do not have an accurate playing time to offer). Prepare for your first game to be longer than that advertised and if planning a first face to face game, I would suggest running turns 1 - 5 solitaire first, to get a feel for the game before meeting your oponenent. It would be easy to explain this game to another player.